I heard someone say that no one is forthcoming about the what it costs to build a tiny house but, unfortunately, there is no single answer to this question. The costs involved vary greatly depending on many different factors and most tiny houses are built to be unique. Though there is no simple answer, there are some variables listed below which can help you get a better picture of what your dream tiny might cost. 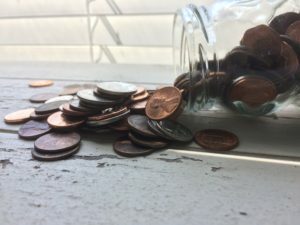 For a detailed way to keep records of your own building costs, hit the subscribe button at the bottom the page to receive a free, super simple Tiny House Budget Tracker. You can add your budget at the top of the page, adjust the materials, costs, and amounts to suit your design and start getting an idea of how much your build will cost you. The tracker will automatically deduct your expenses as you add the costs and quantities of each individual element. For now, here’s some food for thought based on my own tiny research journey. Hope it helps. What type of tiny are you wanting to build? The size, style, and structure will impact on costs. Are you wanting to be off-grid or will you be needing to hook up to current infrastructure? Are you wanting a dry tiny? What type of bathroom set up do you want? If on a tight budget, a humanure bucket loo is going to be a lot cheaper than a natures head toilet or separett toilet. Will you be designing your own tiny? Cool programs like SketchUp can be a great way to keep the design cost down. After you spend some time scratching your head trying to work out how to design a toilet (or is that just me? ), you’ll find the 3D warehouse has a bunch of prebuilt elements that you can modify and insert into a design. At this point, there is a free, non-commercial version you can download. Will you be needing consultants? If you are like me, not a professional builder, it may be a good idea to your design sense checked by professionals. Getting things such as load bearing, structural integrity, and safety elements checked by a professional will add to your initial costs you but could be worth every penny (and then some) later. No one wants their tiny to fall to bits the second it hits the open road. There are many tiny home plans available that can be purchased at a reasonable price. 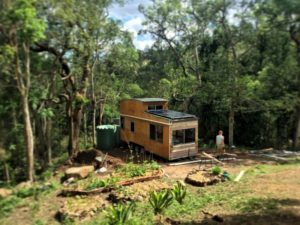 If purchasing a plan, and wanting it to be mobile, check if the plan will be suitable for an Australian mobile tiny home. For example, things like shingles, that may easily come off, may impact on road-worthiness here in Australia and could turn out to be an expensive mistake later. TIP: If purchasing a plan, make sure you get a version that can be edited to suit your needs. Larger trailers will cost you more and, once over a certain length, will require ongoing expenses each time you wish to move your tiny home. Also, it’s worth keeping in mind that some plans on the internet are designed for trailers much larger than what can be legally towed here in Australia. Working out your measurements with your end goal in mind will save you $$$. Do you want a stationary tiny home? If you are wanting to “build by the book” you may also need to factor in size, building codes, and permits for your local area (and all the associated costs). Are you wanting to buy from a tiny house builder? Buying from a builder can be a great option. There are some brilliant tiny home building businesses popping up here in Australia. A great builder can be worth their weight in gold and worth every cent spent on labor. When purchasing a tiny home from a builder, being really clear upfront about any desired modifications and personal needs can save you a fair chunk of money, time, not to mention some headaches. Expect that any modification you make will cost you extra and, and that, unlike a standard size home, making major changes to your tiny house half way through a build may not always be possible. If the changes are possible, they could inflate your costs more the later you leave them in the building process. TIP: Once you’ve committed to purchasing a base model, some builders may be open to you taking a copy of the plan home and modify yourself. Once you have everything the way you’d like it to be, then you can sit down with your builder and discuss what modifications are possible before the build has been started. Some may prefer to work through the modifications with you, but it doesn’t hurt to ask though right? Will you be reducing your costs by doing some of the labor yourself? Getting on the tools and putting in some “sweat” equity can save you a lot of money. Be sure to bring this up with your builder before committing to taking on their services. Not all builders will be open to working with unskilled workers (it’s an insurance thing) so gaining agreement on being part of the building process up front is a good idea. Will you be building your tiny yourself? Almost anyone can build a tiny and if you can afford the time, AWESOME! I love hearing about people building their own tiny houses. So inspiring! Still, although this can be the cheapest labor option, be aware that it will most likely cost you far more in time and energy if you don’t already have the knowledge and skill (or have amazing friends/family with the skills). If you are taking this option, research well, plan like crazy and allow more time than you expect to avoid rushing and making expensive mistakes. If in doubt, don’t hesitate to ask an expert for a bit of guidance or reach out for advice. To some, it sounds counter intuitive that paying for professional advice can save you money, but sometimes it’s a darn good investment. Oh, and that saying, “measure twice, cut once” is really good advice. (I have heaps to learn and I’ve practically murdered some lovely bits of wood by not following this golden rule). Are you planning on using recycled or new products? I love the idea of people building with as much recycled material as possible and I, like anyone else, love a good freebie. Still, some recycled products can work out to be more expensive if the recycled components are not in good repair or aren’t easily restored to a build ready state. Keep this in mind when picking out those types of pieces. Rather than going completely recycled, collecting off cuts/left over stock from hardware stores is a good way to achieve an ethical build by reusing resources that would otherwise be headed for landfill. New products may be easier to work with, but often will cost you more. A mixture of old products and salvaged material can be a great cost effective solution for some. Where will you build your tiny home? If you have the space to build it somewhere for free, brilliant! If not, will you need to rent space to build on? Some cities have community workspaces that you can rent. I highly recommend looking up what’s in your area. Melbourne especially has some great work spaces that you can rent to build different elements for your tiny. What tradespeople will you be needing? Will you be needing a plumber or sparkie? Although in a lot of cases, it is possible to do everything yourself, for some, it can be safer and less time consuming to have a professional do the things you aren’t confident in. For example, I know I could spend the time learning how to and doing my own electrical work, but I know it’s not one of my strengths and my set up is complicated (at least in my eyes) so I would rather a professional do it for my peace of mind and to save time. What products do you want to build with? Given the scale of a tiny house, rich and lovely materials can be more affordable, but if you are on a tight budget, there are heaps of things that you can do to keep your costs down. If you aren’t too set on particular materials, as mentioned above, you can try asking local business if they have left over stock from other jobs. Often they will sell it to you at a great discount if they can’t do anything else with it. You can search garage sales, second-hand shops, and recycling yards and pick up some great finds and save your money for that beautiful bench you want. Speaking of bench tops, keep in mind the cost of working with some materials. I’m in the process of planning for a tiny build for next year and I recently learned that the cost of custom fitting a beautiful little bit of marble is going to cost a pretty penny, much more than the cost of the marble its self. And the awesome wood I picked up for free? Well, let’s just say that didn’t turn out to be the cheapest of options either. Whoops! In a tiny home, you’re able to make less go a lot further than you would in a standard home. I think it comes down to the quality that you can afford, the lifestyle you want to have, durability and the personal style you are going for. I hope that clears up why not many people give straight answers when you ask how much it costs to have a tiny built. Clear as mud right? I promise the money question gets easier to answer for yourself with research and as you become clearer on what tiny is best for you. Planning well is key and as my Nan used to say “all the little bits all add up to big bits if you’re not careful” (But I think she may have been talking about food). If you’re keen to really to get to work on nutting out your tiny costs and budget, don’t forget to subscribe for that Tiny House Budget Tracker. Until next time, happy building tiny lovers!